Announcement Thistlewhite Designs is a floral shop for those of us lacking a green thumb, owned and operated by Annica Anderson in Lawrence, Kansas. Welcome in the changing seasons with some un-killable flowers. Each sprig is entirely hand crafted from beginning to end - cut by hand and meticulously pieced together. Reusable seasonal wreaths make perfect gifts for your nature-loving friends, your mom, or even yourself. Display them on your front porch to welcome the changing of the seasons, or use them as a textural wall hanging. 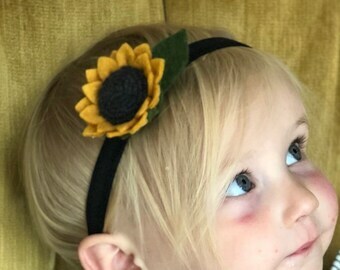 Sweet felt flowers help your baby or toddler make the perfect microfashion statement. Celebrate her first birthday in style with an accessory that will have all her friends talking - even if you can't understand a word they say. Thistlewhite Designs is a floral shop for those of us lacking a green thumb, owned and operated by Annica Anderson in Lawrence, Kansas. Well made and so adorable!! Great Seller! Fast Shipping! Beautiful Flowers! Highly Recommended! LOVE. 10/10 recommend. Thank you for your hard work!! Every flower is cut meticulously by hand. No shortcuts here! I handcraft every single item in my shop because I want your piece to be truly unique. Arranging flowers is an art form, and sometimes it takes a couple tries to find just the right flower. Sourcing elastic bands for baby accessories at one of my favorite local stores - Sarah's Fabrics. 100% wool felt is more costly, but it makes such a big difference in quality! I just want to make pretty things. I’m Annica Anderson, the designer + maker behind Thistlewhite Designs. My husband and I live in Lawrence, KS and LOVE it. My background is in graphic design, and I’ve worked in the Kansas City area for a few years now. But after being laid off, I found myself with an excess of free time and a shortage of creative outlets. So, as I often do to satisfy my creative itches, I started crafting. 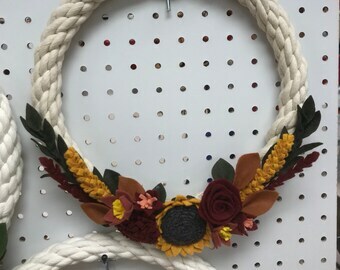 I made myself a felt flower wreath, hung it on my door, and posted a picture on Insta. Before I knew what was happening, I had so many of my friends and family commenting on the post telling me how much they loved it. So I posted again, saying it was available for purchase if anyone wanted one. I thought at best it would give me something to do (which I desperately needed), and maybe bring others joy to have a wreath of their own. After weeks’ worth of orders, and friends of friends reaching out, I thought I might just be on to something. Thus, Thistlewhite was born. I’ve always loved making beautiful things for people I love, and it’s incredibly humbling to see the response from my community! I never would have made the leap if it weren’t for so many people - friends, family, even strangers - telling me I should just do my own thing. It's changed from this little project I started to keep myself sane into something so much bigger than myself. And even though it's just me, crafting away while I binge Gilmore Girls for the umpteenth time, it feels like something that belongs to the community. It feels like something much bigger than me that I get to be a steward of. Having grown up in a creative home, I've always loved creating things of beauty and meaning for those in my life. My background in graphic design taught me crucial principles and gave me an aesthetic sense that informs all the creative work I do. Please note that refunds can only be made to the same payment method used at checkout. If the card used to purchase the item is no longer valid, I can't offer a refund. Buyer is responsible for cost of return shipping. If the item is not returned in its original condition, the buyer is responsible for any loss in value. I ship using USPS, and I package all my products very carefully, in sturdy cardboard boxes and well-padded to prevent any damage during shipment. Some bending may occur during shipment, but this is normal. Just give it a little TLC and your forever flowers will be back to their perky selves in no time. 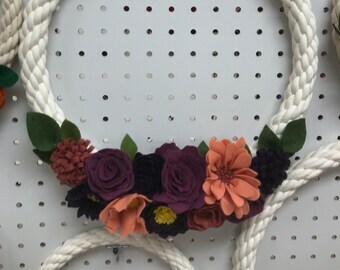 Please allow 5-7 business days for me to craft your custom felt florals. I'll ship your order as soon as it’s done! After shipment, you can expect it to take about 4 days to reach you. I'm more than happy to create custom pieces for you or your loved ones. Just send me a convo with details about desired size, color, and any specific flower varieties, and I'll reply promptly with pricing and timeline. I'm usually able to have a custom order shipped within 5-7 business days.